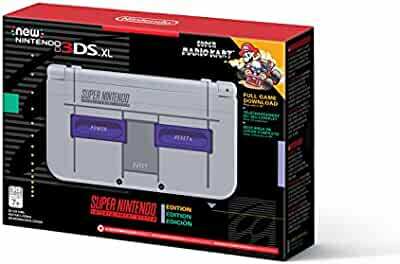 On Amazon.com you can now get this Nintendo New 3DS XL Super NES Edition + Super Mario Kart for just $149.99 shipped. The New 3DS XL includes the full game download of Super Mario Kart and will play all Nintendo DS games, however those games will not play in 3D. Plus, you can switch 3D mode on or off if you prefer not to use it.